Rogue One: A Star Wars Story is available now on Blu-Ray, DVD, and Digital Copy. 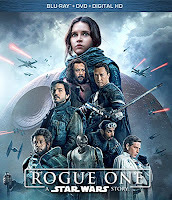 Rogue One was released Theatrical December 16, 2016. It was the highest grossing movie of 2016 with a total box office of over $1 Billion. This exciting addition to the Star Wars story reveals what the rebels had to do to steal the plans for the dreaded Death Star.